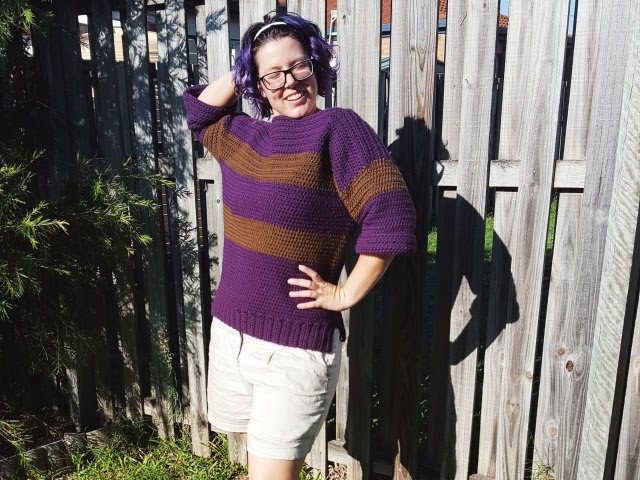 So I never expected to say that within 4 weeks of starting this sweater that it would be finished and able to be used. I started this expecting to MAYBE get it done by this winter. But it ended up being such a quick make. 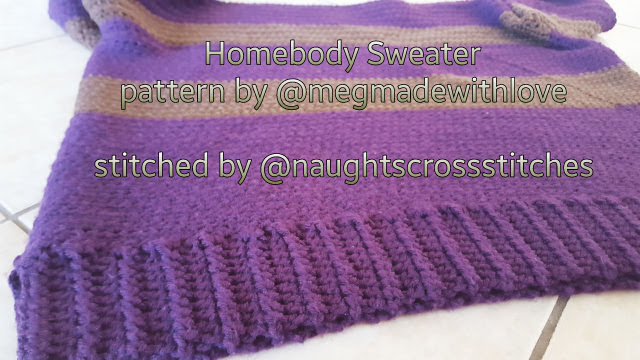 It's the Homebody Sweater pattern by Meg Made With Love. 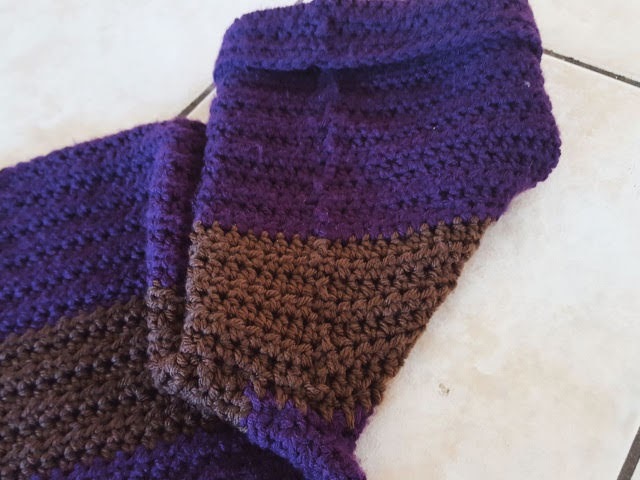 I used Spot Saver yarn from Spotlight in the purple and donkey. 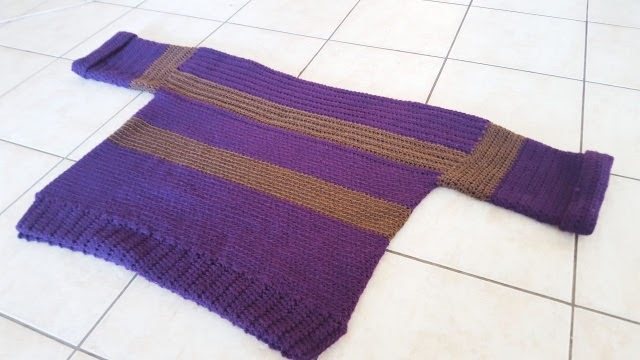 I had bought the purple last year thinking of maybe making a shawl but I wanted to start a project and this one was calling me. The spot saver is a 10 ply or worsted weight yarn like the red heart super saver (at least that is my understanding). I made a size medium with a 5.5mm hook so it made quite a heavy thick fabric. Next time I will use 8ply yarn and a larger hook to make a softer fabric. It's a very boxy sweater designed to be worn off the shoulders. With arms that are meant to be cuffed. I love how it looks on me. Though you were really lucky to get any photos with me modelling this as it was REALLY hot over the weekend. You wouldn't think that it is now autumn but the temperature is still over 30 degrees celcius most days. Now being me and being a little laxy I did make some significant changes to the pattern. 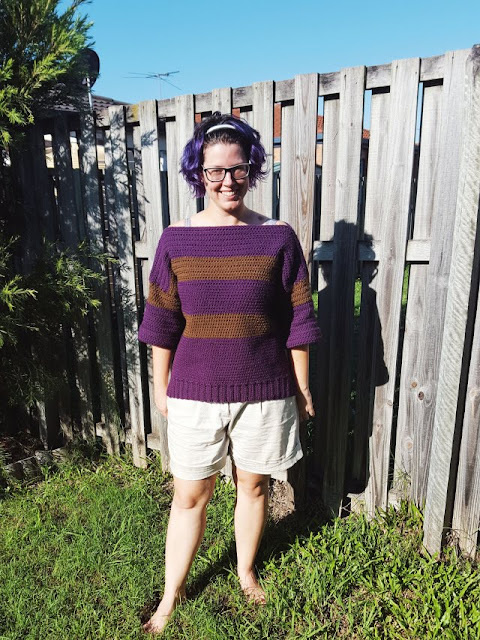 I worked the main body of the sweater in the round. 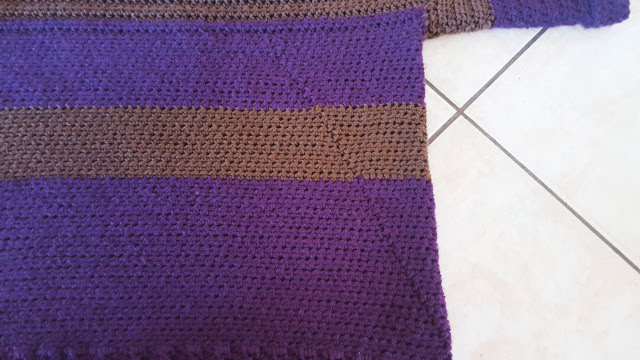 Instead of working the front then the back and then seaming I didn't want to have to seam it at all so I did the two bottom rib sections and then joined them in the round when I did the first row of the body. I did have one problem with this as you can see by the photo above my seam moved. I managed to fix that for the arms by turning every row but forgot about it for the main body. Now the pattern calls for you to seam up to row 33 or something (check the pattern for your size if you want to make these changes.) So I worked in the round until then and then worked across the front the 72 stitches (in my case) and just worked the front up to the top. Then I came back in and joined the back on and worked it up to the top. I'm sorry I don't have any photos of this process because it was all done in the middle of lectures at uni and I felt very self conscious trying the take photos. But if you want to know more I am actually waiting for yarn to make a second one so .... photos will be coming I hope! Also send me a message and I'll try to explain it a different way if you want. I then did a single crochet seam across the shoulder points. I did debate doing a join as you go thing but I wanted a very solid shoulder point. To add some structure. I then joined the arms on as the pattern stated and went from there. But because of the green stripe it isn't noticeable as it could be. Will I make this pattern again? Hell yes and I already have yarn on the way, but this is time I will do it differently. What would I change? 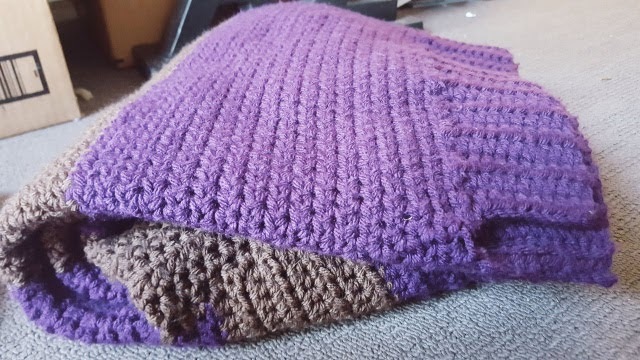 I would work the body in the round again but this time turning every row to create a seam up the side and also I would work it in a yarn other than acrylic. I am also tempted to try shaping the sleeves to come in more on my next one so that they're sitting tighter around my arms instead of just hanging but I may not do that if I can manage a drapier fabric overall. Have you attempted this pattern? How did it go for you?